Toejam and Earl was originally released for the Sega Gensis way back in the temporal boondocks of 1991, and despite its alien rappers on Earth premise—read more on Wikipedia if you're unfamiliar—it became a bona fide hit. A pair of sequels, Panic on Funkotron and Mission to Earth, didn't fare quite so well, but now the alien duo is hoping to get back in the groove on Kickstarter. Dazzling wordplay very much aside, that's actually the name of the new game—Toejam and Earl: Back in the Groove. It's being headed up by original co-creator Greg Johnson, who described it as "the ultimate Toejam and Earl sequel that the fans have been asking for all these years," and unlike the prior sequels it will be very much like the first game. "We plan to go old school with this one. Fixed isometric camera, 2D sprites, simple controls, and an emphasis on coop play. It will also pull in some of the more beloved elements from game two, AND we have a list of exciting new gameplay elements planned as well," Johnson wrote in the Kickstarter pitch. Terrain will be rendered in 3D, enabling the developers to "do some really fun stuff," and there will also be plenty of funky music. The Kickstarter goal is $400,000, an amount Johnson assured Polygon will be more than enough to get the job done. There are currently only three people working on the game—Johnson, an engineer, and an artist—and he said he didn't want that number to grow much beyond eight. He also doesn't want to rush through development: The Kickstarter has a delivery date for the physical rewards of November 2015, but the game itself will take a lot longer. "If I can, I want to take two years to do this," he said. "I want to have a lot of time to play it and playtest it and polish it. I feel like that's what will really yield the best results." 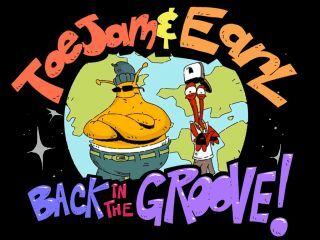 The Toejam and Earl: Back in the Groove Kickstarter runs until March 27. And now, you may enjoy this extraordinarily weird video in which Tim Schafer and Will Wright express their undying love for the previous games, and complete confidence in Johnson's ability to make a new one.